Twenty-seven species of whales and dolphins, and 14 species of seals live in or adjacent to the Antarctic Sector of the Pacific Ocean. Some are permanent residents, other migrate in and out of the region, and a few are itinerants from northern waters. This chapter reviews the occurrence, past exploitation and present status of these southern marine mammal species. Until the late 18th century, marine mammals in the Southern Ocean lived unmolested in large numbers in a productive, yet relatively simple, ecosystem with an abundance of food, birds, and other marine organisms (Fig. 9.1). Fig. 9.1. 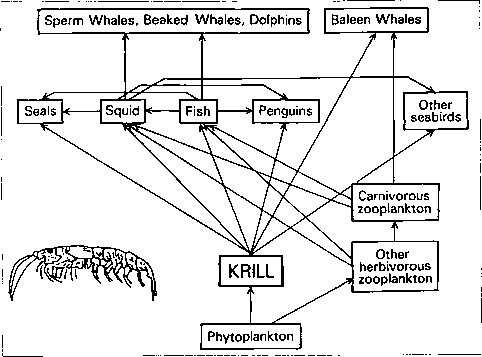 The crustacean krill forms the central link in the Antarctic food web (after Barnes, 1982). consumers in Antarctic waters, including all the marine mammals, which are ultimately dependent on krill and other low-level species (Fig. 9.2). Explorers who first traversed the Southern Ocean in the late 18th century reported in their journals large numbers of seals and whales in those waters, and it was only a few years later that commercial exploitation began on the openly accessible species. 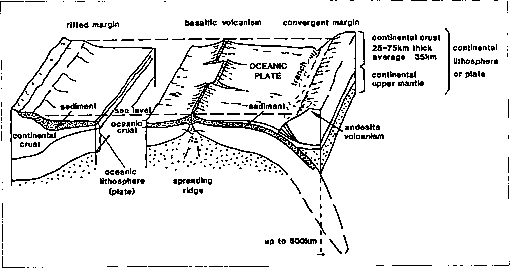 It was inevitable that in time the resource would be over-exploited, given its open-access (Bonner, 1982).